Why I love her: Mackenzie Dern was actually introduced to me through my boyfriend who kept saying "Yeah, she's super hot." I didn't think much of it, until I saw her in action. She's amazing and as he said, definitely easy on the eyes. Although that hardly matters when talking about a competitor of her caliber. Starting at the age of 3 and being the daughter of Luciana Tavares and Wellington Dias, Jiu Jitsu is in her blood. She has won a world Championship in every belt as she made her way up to black belt. She's a natural athlete who is as quick as she is smooth. She thinks well on her feet but is comfortable on her back, she is a smart competitor and every time I watch her I'm in awe. I never know what to expect from her, which makes her so exciting to watch. On top of that, she is the first female black belt to ever fight in Metamoris invitational draw and she's only 20 years old. Best Asset: She's strategical, but she never rolls as if she is counting points. She is always on a mission to get a submission. One of my favorite fights is her most recent against Talita Nogueira. She didn't win in the end but it was brilliant to watch! Feel like watching more cuteness? 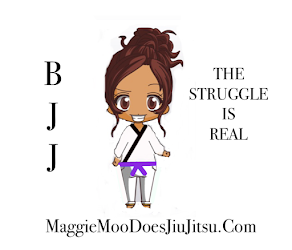 Check out Mackenzie and her boyfriend Tanquino, as they discuss BJJ couples and training together.